Last Friday, the Russian Central Bank's First Deputy Chairman, Alexei Ulyukaev, made a remark that sent shivers through Russia's currency market. He said that within the next few days, he expected the ruble to weaken to the lower limit of the currency basket corridor. The market reaction followed on Monday, when the ruble rate broke through 30 rubles to the US dollar for the first time this year. 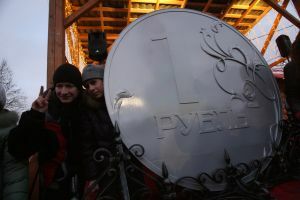 The trend is likely to be short-lived, however, as the ruble rate is expected to stabilize today and regain part of its losses tomorrow and on Friday, helped by the traditional end-of-the-month spike in demand for rubles. Ulyukaev's statement was issued after two weeks of continuous ruble appreciation. Since the start of the year, the ruble strengthened by 2.6 percent in nominal terms against the bicurrency basket and late last week was trading very close to the higher limit of the Central Bank's currency corridor. In order to halt excessive appreciation, the Central Bank was forced to buy a few hundred million dollars, according to Ulyukaev. The Central Bank's direct verbal interventions in the currency trade represent a new policy tool, and its use has definitely proved to be effective. It would not be surprising if the bank used the same tactic at a later stage. However, this is only a short-term tool and its effectiveness depends greatly on the general market sentiment, which is currently characterized by risk aversion and a rush to the dollar. This trend is not expected to to continue for very long, and traders should maintain a positive stance on the ruble. The Russian currency is expected to trade below 30 rubles to the dollar for most of this year.